My story is the perfect example to show that foods can make us sick, and that foods can also heal us! My story also shows that we don’t always have to rely on conventional medicine as the only option for treatment. Actually, I don’t believe in conventional medicine anymore, because for the most part, with that approach only the symptoms are treated without getting to the root cause of the health condition. I wanted to prove to others and myself that there are alternate ways to let our bodies heal, naturally. And I did it with the help of a great alternative doctor. He quickly determined that I had an autoimmune disease which went undiagnosed for many years. This proves that my regular physician was only treating my symptoms. I was determined to combat this autoimmune disease naturally with my alternative doctor’s program which included changing my diet and using only natural supplements. Now, 10 months later, I can honestly say that I have never felt better in my entire life! I hope my story will inspire people to make positive changes in their lives, to consider letting their bodies heal naturally, and to prevent autoimmune disease altogether by taking a preventative approach. Lastly, my story very much relates to our dogs because they are exposed to the same health threats and struggle with many of the same conditions people do, and we can also use alternate ways to help our dogs let their bodies heal naturally. After struggling with anxiety for many years, worsening symptoms such as brain fog and problems keeping my balance when standing or walking, prompted me to consult with a doctor who uses a very different approach than conventional practitioners. It turns out that I have an autoimmune disease called Hashimoto’s thyroiditis, a condition in which your immune system creates antibodies that damage your thyroid gland. 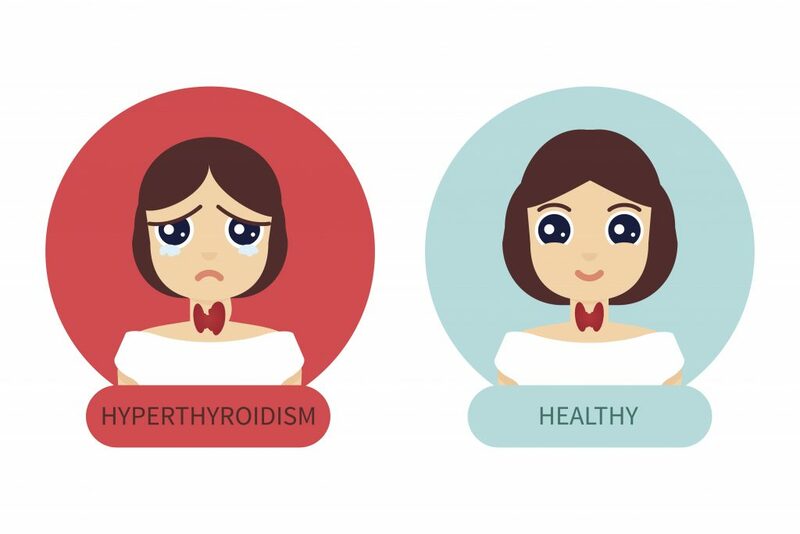 The thyroid gland is part of our endocrine system, which produces hormones that coordinate many of our body’s functions. I was told that 90% of the time, Hashimoto’s disease is caused by leaky gut, which in turn is often caused by sensitivity to gluten. Hashimoto’s thyroiditis is an autoimmune condition in which the body perceives its own tissue as foreign. Your immune system is basically attacking your own body. Not only did the antibodies damage my thyroid gland, but also attacked my brain and caused a mild brain dysfunction. In addition, a neurological exam revealed that I had lost some sensation in my hands and primarily my feet, causing my balance issues when standing or walking. 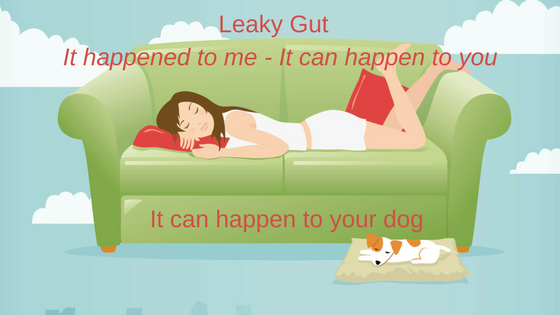 Leaky gut syndrome is a rapidly growing condition that many people as well as pets are struggling with and don’t even know it. Even worse, most conventional medical doctors and veterinarians are not familiar with this condition, don’t test for it, and don’t treat it. The symptoms of this condition are mostly misdiagnosed and patients are often prescribed unnecessary medications and undergo unwarranted procedures. With leaky gut (also referred to as intestinal permeability) the lining of the digestive tract gets damaged, which causes larger than normal holes to develop so things that normally cannot pass through the intestinal lining, are now able to. Things that can pass through those enlarged holes include proteins like gluten, bad bacteria, undigested food particles, and even toxic waste can leak from the inside of the digestive tract into the blood stream and cause an immune reaction. This leads to inflammation in the body and most all disease, including cancer, begins with inflammation. Therefore, leaky gut syndrome does not only affect the digestive system, but can lead to many other conditions like thyroid condition, joint pain, skin issues, bloating, digestive problems, food sensitivities, depression, anxiety, muscle pain and chronic fatigue, weight gain, and more..
My alternative doctor did a variety of specialty tests mentioned below. It was a whole body check up to determine the root cause of my health issues. It’s like bringing a car that has problems to a mechanic for a complete checkup. This checkup will reveal all the issues with the car, and once corrected, the car will run like new again. I look at our body as a machine as well, and unless it is well maintained and deficiencies and defects are determined and addressed, our health will suffer and continue to deteriorate. I went through an 8-months program where my alternative doctor corrected each determined deficiency and defect with natural supplements and by adjusting my diet. At the end of the 8-months program, the specialized test were repeated and revealed that all my values were either normal, or very close to normal. I am a well running machine now, and as mentioned above, I have never felt this great EVER – not even in my 20’s! However, that does not mean I am healed now. When you have an autoimmune disease, you will have it for life, and therefore it will change your life FOREVER. You can only achieve remission, and continuing with the program is an absolute must. If you cheat, you will have set-backs in the form of new immune responses that start the visious cycle all over again. While waiting on the test results, I really didn’t think I would have leaky gut because I never had any digestive issues in my entire life, and I thought I was eating pretty good. I only ate fast food on occasion and especially during the last 3 to 4 years had focused on eating healthy, avoiding GMO foods and avoiding gluten. But I would learn later that the damage was already done by the time I started focusing on eating healthier. I remember that I had a weird feeling the day I drove to my doctor’s appointment to receive the results of the leaky gut and food sensitivity tests. Something made me stop on the way for a slice of pizza. I guess I thought that perhaps I will never be able to eat it again! And that was exactly the case. 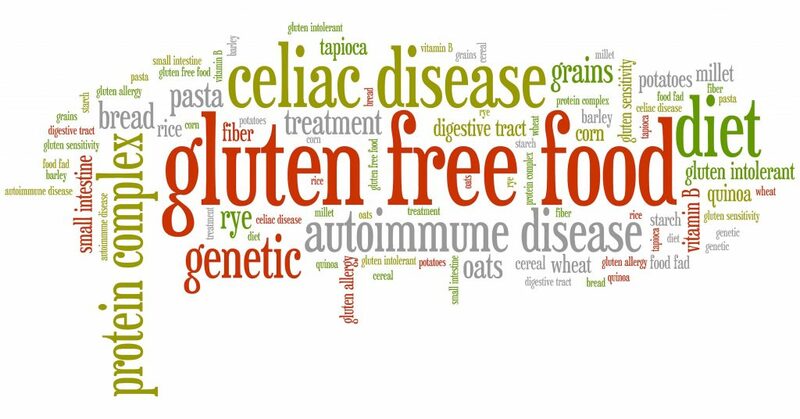 The test results revealed that I had leaky gut, and that I was not only sensitive to wheat/gluten, but also to most of the gluten cross reactive foods like rye, barley, spelt, polish wheat, dairy, oats, yeast, sesame, millet, corn and rice. So yes, I would never be able to have pizza again, bread, cake, cookies, potatoes (except sweet potatoes), rice (except wild rice), chocolate, peanut butter, milk, yogurt, butter, milk, eggs, peppers, apples, avocados, grapes, white wine, red wine… and the list goes on! My doctor said “We’re in big trouble here!” when he looked at my food sensitivity test results. I remember crying on my way home. I would never be able to eat my favorite foods again, and this would change my life forever. How did I get Leaky Gut? While there are other causes for the leaky gut syndrome (mentioned above), poor diet is definitely the number one contributor, and I know that is why this happened to me. Yes, I had some bad habits like drinking soda, eating processed foods, not eating enough vegetables and fruit. I think we can all relate to that, but I know my food choices and eating habits were by far not as bad as what I have witnessed in many other people. The real problem is the poor quality of our food supply. There are so many unhealthy and toxic elements in our foods from hormones, antibiotics, fertilizers, pesticides, nitrates, heavy metals to artificial colors, chemical preservatives, emulsifiers and thickening agents. There is molecular alteration of food, and there are genetically modified foods, and the list goes on. I grew up in a small village in Germany and we knew exactly where our food came from. The meats came from the farmers in the village who would slaughter a cow and pig for us every so often and everything was cut up, portioned, and put into chest freezers. The chicken, eggs and milk came from those same farmers. We grew our own vegetables and fruits, and basically everything we ate was homemade. It was pure, clean, and of good quality. Granted, things have changed in Germany as well, but the quality of their foods is by far better than the quality of the foods available here in the United States. The way I look at it is that I went from one extreme to another, and over time, my health slowly started to deteriorate. The doctor I now work with helps your body heal itself through changes in diet, by removing foods that damage your gut based on your individual food sensitivities, by replacing them with healing foods, by repairing the damage with specific natural supplements, and by rebalancing your gut with the right probiotics. My doctor’s Autoimmune Food Protocol is a specific Paleo program. We are not talking about the general Paleo diet you read about on the internet. I was given a specific lifetime Paleo program based on the food sensitivity blood testing that was done. Yes, it is a “lifetime” paleo program because any foods you were found sensitive to, should not ever be reintroduced into your diet again. According to my doctor, there is information on the internet by doctors and nutritionists stating it is okay to reintroduce foods you tested sensitive to at some point in time. He says that is wrong and that the best immunologists in the world will tell you not to do so. The immune system has tremendous memory and will react to these foods for life because of a white blood cell called “memory lymphocyte”. In addition to my specific paleo diet consisting of meat, poultry, fish, vegetables, fruits, nuts and seeds, I had to stop eating sugar, high fructose corn syrup, aspartame, and white salt. All of them cause free radicals, excitotoxins and inflammation. The goal of the program is to reduce inflammation and stop your immune system from attacking your body. So what am I eating? Well, I am eating the foods that are really good for you – whole foods! I am not sensitive to any of the meats, poultry and fish, so I am eating chicken (has to be hormone & antibiotic free), beef (has to be grass-fed), natural bacon (has to be without nitrates – cured with celery salt), wild Alaskan salmon, Alaskan scallops, and wild-caught shrimp. I am eating vegetables and fruits (have to be organic), those that I am not sensitive to. After many failed trials, I managed to bake a lemon cake and blueberry muffins with all alternate ingredients. I drink lots of water, coffee (has to be organic) in the morning, and some Kombucha during the day. That’s it. Very basic. Actually, if everyone would eat like this, people would be much healthier – and loose weight too! Just like most women put on some weight as they age, I also put on 20 pounds. This extra weight really bothered me every single day in the last 15 years and I couldn’t find a way to loose it. When I had to change my diet and started eating whole foods only, that extra weight basically fell off me in just a short period of time. I am back to the same weight and dress size now as in my 20’s! A very nice side effect that comes with eating healthy! I have to tell you upfront, tenacity has always been my strength, and is what helped me follow the program and stick to it 100%. I have not cheated yet, and I won’t cheat. When I set a goal, I will do whatever it takes to get there, and I knew this was my only chance to take my health back, naturally. Whenever you choose a natural path, you need to understand that it will take time and patience. At the beginning it was very hard, harder than I thought it would be. If I had to do it over again, I would check into a hotel for the first two weeks because I made everyone around me suffer. Keep in mind, my list of food sensitivities is much longer than those of most leaky gut patients. I hated that I was so limited with what I could eat, and nothing tasted good to me at that time. When I was craving something to eat, all I had to reach for was a piece of broccoli, meat, or fruit. I have to say, everyone I shared my condition and dietary restrictions with, said they couldn’t do it, meaning they couldn’t make it not eating their favorite foods anymore. Literally everyone, including my own family, friends, co-workers, and even my primary physician! It surprised me, but I didn’t really let it bother me. It just depends on how bad you want something, and I wanted nothing more than to succeed at this. It probably took me at least 4 months until I started enjoying the foods I was eating. Part of it was me learning how to prepare the food so it would be tasty. It is very limited what I can use to add flavor to my food, but I figured it out. Even simple things like using a cast iron pan to cook my steaks and chicken in made a huge difference in flavor. Now I can truly say that there is nothing more delicious than eating whole foods that haven’t been altered from their natural state. If someone would make me bite into a peanut butter and jelly sandwich now, I honestly don’t think I could even swallow it! While for many people eating is a social activity, I only eat for one reason these days, it is simply to nourish my body with the right foods for optimal health. What I struggled with more than the food at the beginning, was all the water I needed to drink (64 fl oz/day). I have always known and was told it is important to drink a lot of water, but I have never been able to drink a lot of water because it made me feel nauseous. However, I stuck to my plan from day one and did what I was supposed to do. I was nauseous for almost 2 weeks, couldn’t think straight or focus on anything, and I acted like a monster. I hated everything and everybody around me, including myself. Then all of a sudden that part went away, and ever since, I can’t drink enough water, and I love it! 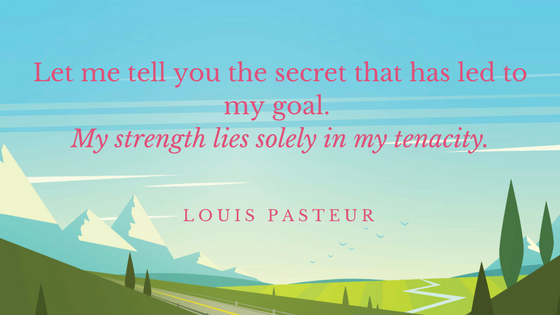 The next person may have different struggles on this journey, but when you persevere, you will get there, and at the end, the rewards are ALWAYS bigger than the struggles ever were. At first, I was mad this happened to me because I would need to live with restrictions for the rest of my life now. I am mad about the poor quality of our food supply, and the fact that the foods I ate contributed to a brain dysfunction, balance issues, and an autoimmune condition, were a true shocker and a true eye opener for me. I have no doubt that if I had continued on that same path I was on and just relied on the conventional health care that is offered to us, my health and quality of life would have continued to deteriorate at a rapid pace. My immune system would have continued to attack my body causing more damage to my gut, thyroid, brain, as well as neuropathy in my hands and feet. It could have very well lead to additional damage in other parts of my body, and perhaps even cancer. Therefore, I was extremely mad about our health care system failing us. While I pay a very high health insurance premium every year, I feel I don’t get anything in return. I am so thankful for the great alternative doctor I found, the great care I receive now, and the great results I achieved with his program, but it all comes at a high price – not covered by insurance. A book I highly recommend is UnDoctored by William Davis, MD. Undoctored explains why health care has failed you and how you can become smarter than your doctor. Dr. Davis gives you all the tools you need to manage your own health and sidestep the misguided motives of a profit-driven medical system. I am not mad anymore though, and why would I be mad? I took matters into my own hands and came out on top. While I feel that I have not been able to enjoy some of the best years of my life due to my health issues, I also know that I will enjoy the years ahead of me so much more than I ever would have if this hadn’t happened to me. It truly was a life changing experience. I have learned so much from this experience which enables me to be smarter when it comes to managing my own health going forward. It also enables me to share my knowledge, motivate and help others. It is a very powerful thing when you are able to turn something negative into something positive. How does this relate to our Dogs? Leaky gut syndrome is not only a rapidly growing condition in people, but also in dogs. Actually, I personally feel they are even at a greater risk because they cannot make their own choices and cannot take care of themselves. We need to educate ourselves, not only on dog nutrition in general, but we need to learn and understand how environmental changes due to modern improvements in recent decades, and especially changes in our food supply have been making our dogs sick as well. Some of you may know that we recently launched a new website for Olewo USA. Much of the content is new and includes updated information on the importance of gut health, detoxification, and reducing inflammation in dogs. 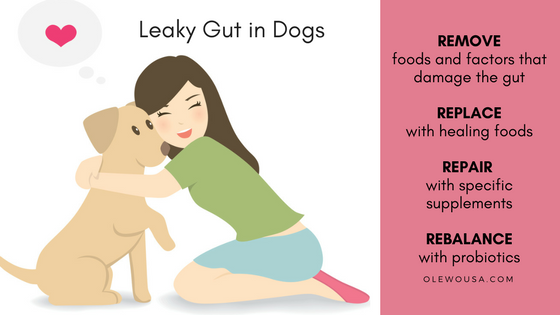 There is information about “Leaky Gut in Dogs”, how it can lead to all kinds of health issues and is the gateway to autoimmune disease. I am the one who put this information together, and I did this just prior to receiving my own leaky gut diagnoses! I truly believe things happen in life for a reason. My newfound mission in life now is to help educate people on the new emerging health threats as well as natural solutions, not only to benefit their own health, but also to benefit the health of their dogs. As the founder of Olewo USA, I have always been very proud to import Olewo pet products from Germany, and distribute these quality products here in the United States and Canada. Olewo has been a trusted brand in the pet nutrition industry for over 40 years. All natural products like Daily Carrots for Dogs and Daily Red Beets for Dogs are designed to add whole food nutrition to the dog’s regular food to promote optimal health and to naturally help alleviate common problems in dogs such as dog diarrhea, digestive issues, skin allergies, itchiness, and more. 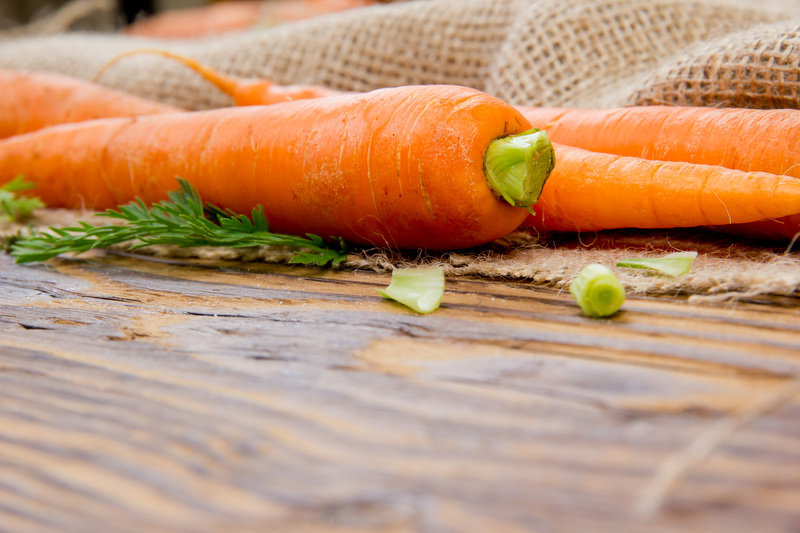 Amazingly, Olewo Carrots and Olewo Red Beets contain a variety of nutrients and provide benefits that play an important role in not only preventing leaky gut in dogs, but can also help heal it. Who would have thought that products as “Old” as Olewo would one day help remedy health conditions in a “New” era. I will be writing many more articles on the details of the health threats we face, what we can do to protect ourselves and our pets, and how we can improve our health naturally. It is my goal to connect with practitioners, nutritionists, product companies, and service providers in the veterinary world to search out solutions for your dogs, similar to those that helped me get healthy again, naturally. Each follow-up article will be on one specific topic only and much shorter than this one – I had to tell my story first! PLEASE, take care of yourselves, and your pets! I have been feeding my dog’s Olewo Dehydrated Carrots and Red Beets for years. I believe that making these products a part of my Dog’s diet helped my Bullmastiff to reach 11 years of age! I will continue feeding these products to help keep my Precious FurKids healthy! Theresa – Thank you so much for sharing! Just like people, dogs need more whole food nutrition to thrive and be healthy. And while dogs only need a small amount of vegetables, it is an important part of their diet because of certain health benefits that only plant material can provide. Root vegetables like carrots and red beets are more nutrient dense than other vegetables and are excellent for GUT HEALTH and DETOXIFICATION – two key factors for our dog’s overall health and longevity. Your Bullmastiff reaching 11 years of age, I have no doubt, has much to do with the healthy diet you have been providing. We just lost Wilma, our Black Lab mix, a couple of months ago and amazingly she made it to 16+ years of age! We rescued her just under 1 year old and provided what we felt was the best of care and nutrition, hoping it would pay off – and it did. Thanks again for sharing! Incredible article Ina! I’ve shared my issues with you in the past and I look forward to following your lead. Thak you so much for the information and I’m so happy you’ve found health!